Over the years, I have helped plenty of businesses improve their online presence. I’ve reviewed websites, done keyword research, edited and optimised web content and helped businesses with links, listings and social media. Local businesses often need the most help, and I am happy to be of assistance where I can – regardless of what the business or organisation does or sells. Funnily enough, when I look back at my list of clients since 2008, some industries seem over-represented in the wide cross-section of businesses that have come to me for help. I have had multiple accommodation providers, dentists (such as this Coffs Harbour dentist), accountants and physiotherapists as clients, for instance. Accommodation websites are among my favourites. I love working on these websites and improving them – making changes that help real potential guests find the site more easily in Google. The basis for any such SEO work is finding specific keyword phrases that potential customers may use and optimising the site for those keywords. Although SEO keyword research can be tedious work, I do enjoy finding keyword phrases that may not be the most obvious but are much likelier to be effective and result in actual traffic by the site’s target market. Importantly, each page on a website can and should be optimised for a unique set of keyword phrases relevant to the topic of that page. Two accommodation providers I am currently helping with their search engine rankings are Yaraandoo and Moffat Falls. The work should result in more targeted visitors to their websites and ultimately in more bookings. 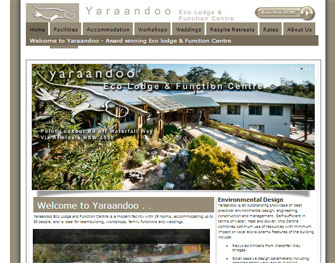 Yaraandoo is an eco lodge between Ebor and Armidale in Northern NSW. The website has pages about the accommodation itself and its facilities that make it an ideal destination for functions, weddings, retreats and conferences. It offers group accommodation for up to 50 people and because it’s located right next to New England National Park, it makes a fabulous bush retreat for a quiet NSW getaway. For those who have always dreamed of a bush wedding, Yaraandoo is also a beautiful place for country weddings in NSW. Anyone looking for individual accommodation near New England National Park, for instance for a bush walking weekend, will find a comfy home away from home at Yaraandoo’s self-contained apartment. Not far from Yaraandoo Eco Lodge & Function Centre is Moffat Falls, which offers a riverside lodge, cottage and cabins. Because it is right by some of the best trout waters in the state, Moffat Falls is popular with fly fishermen who love going trout fishing in NSW. 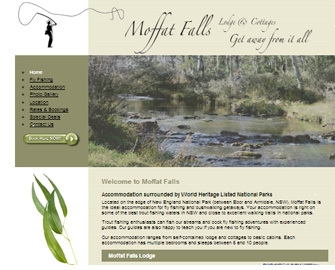 Moffat Falls’ accommodation near New England National Park, Ebor and Armidale ranges from basic, rustic cabins to fully self-contained upmarket accommodation. The lodge and cottage are often used for fly fishing trips and experienced guides are available to give fly fishing lessons or to take anglers on a half or full day fly fishing experience. Bushwalkers in the nearby national parks also really enjoy the location, facilities and natural setting of Moffat Falls. SEO for accommodation can be extremely competitive, particularly in popular destinations. If you’re too small or too new to compete on something obvious and competitive like “Sydney accommodation”, then think outside the box. Find your niche. Do keyword research and select some longer and more specific keyword phrases that are less competitive, but really relevant to your type of business and your ideal customers. Targeting so-called long-tail keywords will make it a little easier for your site to climb to the first page of Google and get more visitors on your site. And a bonus will be that, because you have gone more niche, those visitors are much likelier to be interested in what you offer. Your conversion rate is likely to be higher from more specific keyword phrases. Besides optimising different web pages on your site for specific search terms, make sure you get some natural links pointing to those pages, with relevant keywords for that particular page in the link text if possible, as I have done above. It’s a mistake if all links to your site go to your homepage and they all use the same keyword phrase. Search engines want to see a natural link profile so mix it up a bit and use different word combinations in your link text and try to get incoming links for different pages on your site.